The northern Panhandle is probably the least well known part of Florida for the average tourist. Known as the Panhandle because of its long and thin shape, its climate is more temperate than the rest of Florida. It is also known as the 'Emerald Coast' because of the bright emerald greens and blues of the sea and some of the most beautiful beaches in the whole of the USA with sparkling crystal white sands. Life is more traditional and old-fashioned here with much more of a feeling of the Deep South, perhaps because it is bordered by Alabama and Georgia. Here you will find typical southern antebellum houses and giant live oaks rather than palm trees. Tallahassee is the State capital of Florida and gets its name from the Apalachee Indian name for 'old town' or 'old fields'. It sits amongst rolling hills and has retained many fine 19th century buildings with large oak trees covered in Spanish moss. Tallahassee is also home to Florida State University, founded in 1857. The Old State Capitol was built in 1839 and only replaced by the skyscraper New State Capitol building in 1978 (there is a fantastic view of the city from the 22nd floor). Pensacola is known as the 'city of the five flags' and has passed through the hands of the Spanish, British and French as well as the Union and Confederate forces during its long history. The Spanish explorer Tristan de Luna landed here in 1559, but Pensacola can only claim to be the second most historic town in Florida as the settlement was initially abandoned after the early settlers suffered from hurricanes and disease. St. Augustine on the east coast wasn't founded until 1565, but it is the longest continuously inhabited town in Florida, in fact the whole of the USA. Nearby is the Naval Air Station where the US Navy 'Blue Angels' display team are based along with the National Museum of Naval Aviation which is open to the public. 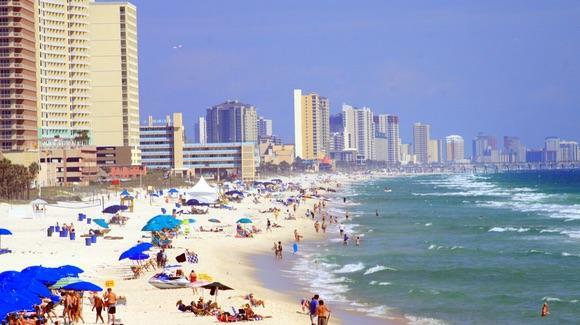 Panama City beach stretches for 27 miles and has the longest pier in the whole of the Gulf of Mexico and is also known as the 'Redneck Riviera' because of its popularity with visitors from neighbouring southern states. These days it is famous for the 1/2 million college students who descend on it each Spring Break. To the east lies the beautiful St. Andrews Recreation Area famed for its beaches and sand dunes.